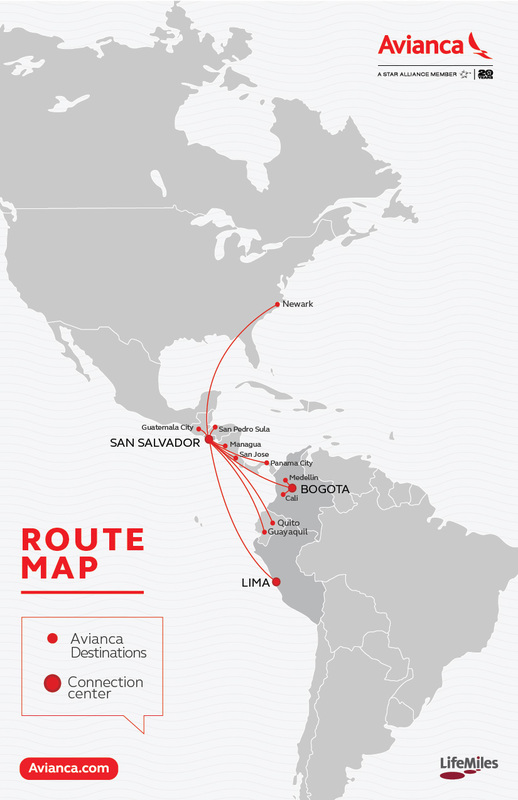 Avianca inaugurates its new route New Jersey-El Salvador and connections. 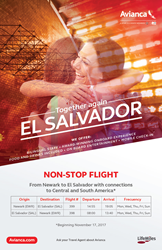 Starting today, November 17th, Avianca offers a direct flight connecting El Salvador International Airport to Liberty International Airport, in Newark, New Jersey and its featured destination: Elizabeth, New Jersey. Elizabeth, NJ is your home-away-from home.... come stay in our Latin American Community, during your next travels into NYC area when flying with Avianca Airlines. Newark becomes the new destination to be added by Avianca to its route network. The flight operates five times a week – Monday, Wednesday, Thursday, Friday and Sunday- starting today, November 17th. Passengers will be able to connect to many more Latin American cities: Guatemala City, San Pedro Sula, San Jose, Managua, Panama City, Quito, Guayaquil, Lima, Bogota, Medellin and Cali. This new flight offers more options for travel, and increasing connectivity and schedules. During the inaugurated ceremony Keila Lacourt, Avianca’s Sales Manager of North USA y Eastern Canada said “we are constantly enhancing service offer to meet our passengers’ needs. This flight will provide a convenient flight option for travelers from Newark in New Jersey, as well as neighboring states like New Jersey, Connecticut, Delaware, New York, and Pennsylvania. We are confident that business travelers, as well as the Central and South American communities in New Jersey, visiting friends and relatives in Latin America, will greatly benefit with this flight”. Newark Liberty International Airport, one of the largest international airports in the United States, is conveniently seated in the Gateway Region of New Jersey, which is largely populated by the nearby Latin American community of Elizabeth, New Jersey. Complete with numerous franchised hotels, as well as a close proximity to New York City, travelers are able to quickly check in and save on their lodging while being able to spend more on experiences. They are also able to enjoy the best of worlds, with big city life close by and the Latin community they are familiar with. "Elizabeth, NJ is your home-away-from home.... come stay in our Latin American Community, during your next travels into NYC area when flying with Avianca Airlines," said Jennifer Costa, Director of the Elizabeth Tourism- EDMO. "We are honored to be a featured destination, easily accessible and just minutes from Newark Liberty International Airport and New York City." The flight will be operated by modern Airbus A319 aircraft with capacity for 120 passengers: 12 in business class and 108 in tourist, or Airbus A320 with capacity for 150 passengers: 12 in business class and 138 in tourist. Newark is now another of Avianca’s gateway destinations in the United States of America, including flights from Bogota to Fort Lauderdale, Miami, New York, Orlando, Los Angeles, Boston and Washington D.C. and from the connection center at El Salvador, to Miami, Fort Lauderdale, New York, Washington D.C., Chicago, Los Angeles, Dallas, Houston and San Francisco. Information, itineraries and ticket sales at Avianca sales points, your preferred travel agency, http://www.avianca.com, and our Call Center in the United States of America (1 800 2842622). For more information on tourism in Elizabeth, NJ, please visit http://www.GoElizabethNJ.com. LifeMiles Silver, Gold and Diamond Elite members, as well as Star Alliance Gold and Priority Passengers or Business Class passengers can access Avianca’s VIP room located on the third floor of El Dorado’s international terminal, including special spaces to work, socialize, rest, eat and even freshen up. LifeMiles B.V. is currently the operator of the LifeMiles loyalty program. Avianca Holdings S.A. affiliated airlines as well as banks and retailers operate as commercial partners of the program. LifeMiles is one of the largest and fastest-growing loyalty programs in Latin America, with more than 6 million members and leading market positions in Colombia, Peru and Central America. Recipient of 6 Freddie Awards over the last three years, including Best Redemption Ability, Best Frequent Flyer Program Promotion, and Best Up & Coming Program, the program is noted across the industry for its strong value proposition for Members and for its innovation in creating best-in-class functionalities and flexibility for members in using their miles. Continuing in this tradition, LifeMiles members can now accrue and redeem their miles through a comprehensive retail coalition in addition to a partner network including hotels, rental cars, online shopping, online music downloads and much more. Avianca is the commercial brand that identifies the passenger and cargo airlines integrated in the Holding Company. With a human team comprised of more than 21,000 collaborators, the airlines directly service more than 108 destinations in 28 countries in America and Europe, with the aid of a modern fleet of 176 short, medium and long range aircraft. Through its membership in Star Alliance, Avianca’s travelers have access to destinations in 192 countries and 1.300 airports around the world. With 18.500 daily departures, passengers have access to 98% of the world’s countries. Its frequent flyer program has 6.5 million members. In addition to its passenger air transportation services, Avianca offers a portfolio of tourism services, cargo transport, courier and aeronautical assistance, through its Avianca Tours, Avianca Cargo, Deprisa and Avianca Services business units. In 2016 Avianca transported 29,4 million passengers. For more information, visit avianca.com, Facebook.com/aviancafanpage and @Avianca_com on twitter.